Spanish director Jaume Collet-Serra (Unknown, Orphan) has teamed up again with Liam Neeson for a new action aerial thriller Non-Stop. Neeson has found a new cinematic lease after the success of the Taken franchise and seems to be brilliant at playing the aged action hero. In Non-Stop, he plays a hard drinking US Air Marshal on board a transatlantic flight from JFK in New York to London and as the plane takes off and settles into cruising altitude, all is not what it seems. Non-Stop is an action murder mystery set entirely on this non-stop Transatlantic flight and is similar to films like Flightplan and Flight. All three films should not be recommended for viewers with a fear of flying. Non-Stop cleverly integrates the cellular digital world in its quirky and suspenseful narrative as Bill Marks, played by Neeson receives text messages on a secure flight mobile device from a suspected hijacker saying that he will kill a passenger every twenty minutes if $150 million dollars is not deposited in a Swiss bank account. Acclaimed actress Julianne Moore (The Hours, Far from Heaven) plays Jen Summers a fellow passenger who assists Marks in tracking down the culprit, while the rest of the cast is made up of character actors like Michelle Dockery and Corey Stoll from such hit TV shows as Downton Abbey and House of Cards. Look out for an underwritten appearance by Hollywood It girl Lupita Nyong’o (12 Years a Slave) as air stewardess Gwen, which proves that Non-Stop was made before Nyong’o won a best supporting actress Oscar elevating her to instant fame. Nevertheless the cast are secondary to the action and suspense on Non-Stop as this mid-flight murder mystery turns into a fully fledged action film, as Marks battles the clock to find out which passenger is responsible for killing off fellow passengers. Non-Stop is hugely entertaining and nowhere near as diabolically stupid as such airline films as Snakes on a Plane or the comedy series Airplane. 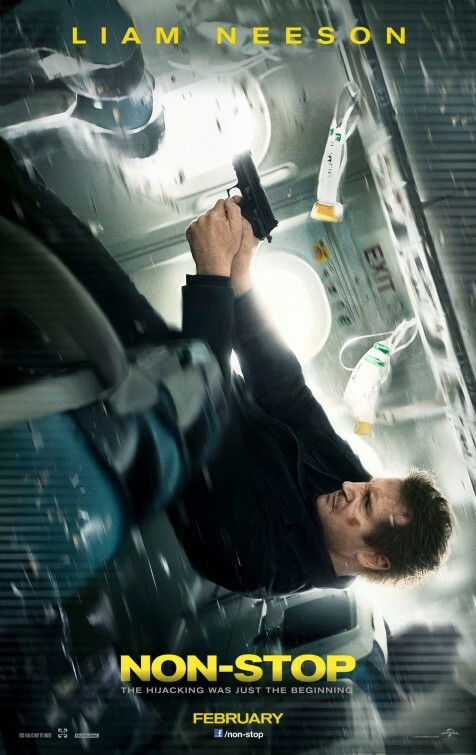 Non-Stop is economical in narrative, huge on suspense and great on twists and unexpected realistically done action sequences all set aboard a 737 bound for Heathrow. Neeson is adept at playing the ripened leading action man with enough emotional and physical baggage to weigh down international departures, and in Non-Stop, he does not disappoint as the main hero, despite all his characters known flaws. If audiences enjoyed Taken and Unknown , then they will love Non-Stop. See it now before making any airline reservations!